At the Platte River Prairies, we conduct prescribed burns for various purposes. Some fires are intended to kill eastern red cedar trees or to suppress cool-season invasive grasses. Other fires are aimed at removing thatch and old vegetative growth – creating lush regrowth that concentrates cattle grazing in one portion of a prairie. For each objective, we prescribe a certain set of outcomes that need to be met in order for a burn to be successful, and a parallel set of conditions (especially timing and weather conditions) that will get us to those outcomes. If we’re just trying to remove most of the old dead growth from a prairie, we don’t need the same kind of fire intensity as when we’re trying to kill cedar trees. If we’re targeting cool-season grasses (and won’t be following up with grazing), we try to burn about the time those grasses are starting to flower. On the last day of March this year, we assembled a crew that combined our staff with employees from the Central Platte Natural Resources District and got ready to burn some hilly sand prairie. Our objective was to remove at least 75% of the thatch and old growth from the burned area so subsequent cattle grazing would be focused in that burned patch while the remainder of the prairie went largely ungrazed. The forecast had predicted pretty high relative humidity readings, but we thought we’d be ok as long as we didn’t have overnight fog or mist. Unfortunately, on the morning of the fire, the grass litter along the ground was more damp than we’d hoped and since the sun was hidden behind clouds it didn’t seem likely that litter would dry much. After considerable discussion and delay, we finally decided to conduct a test fire in the downwind corner of the burn unit to see what kind of burn results we’d get before deciding whether or not to burn the entire 70 acre unit. We also figured it was an opportunity to learn more about how fire behaves under humid conditions. At 1 pm, it was 46 degrees F, 71% relative humidity, and we had winds at about 10 mph. The test fire was definitely instructive. The upper portions of grass plants were sufficiently dry that they burned fairly well, but the dampness along the ground made the fire creep along very slowly, even when pushed by the wind. Following along behind the fire, I was kicking away ash to find that quite a bit of litter was still unburned and covering the soil. After we burned an area about 40 x 40 feet, we extinguished the fire and had a group discussion. The grass was burning well enough that we could probably burn the unit, and much of the area inside the firebreaks would ignite and turn black. On the crests of the hills where vegetation was dominated by bunchgrasses and there was considerable bare ground beneath plants, we’d probably get a pretty complete burn. However, in lower areas where there was more dense vegetation, including some cool-season invasive grasses, we didn’t feel like it would burn very completely at all. In total, we didn’t think we’d reach our goal of removing litter from 75% of the area. Importantly, the areas that wouldn’t burn well (and thus wouldn’t attract grazing) were the ones we most wanted cattle to graze (to suppress invasive grass growth). After talking through our options with the whole crew, we decided to postpone the burn until we had a day with better conditions. You can see from this photo that while most of the dry standing vegetation burned, much of the litter/thatch remained behind. Here’s our group, deep in discussion about objectives, results, and whether or not to continue with the fire. It’s never an easy decision to call off a burn when you’ve got crew and equipment on site. As a burn boss, I’ve had to do that multiple times, but usually when we’re worried about safety because the weather conditions are too far on the hot, dry and/or windy side. In this case, there were no extraordinary safety concerns, but every fire comes with risks to people and property. It never makes sense to burn and not achieve the desired result. We needed near complete consumption of the dead vegetation to attract cattle grazing and carry out our management plan for that season. Since we weren’t going to achieve that, we didn’t burn. As it turned out, we only had to wait four days for another opportunity to burn that unit. On April 4, most of the same crew members assembled and we set up to try it again. Our weather conditions at 11 am weren’t all that different from our previous attempt (46 degrees F, 65% RH, and 12-15 mph winds) but the grass litter was much drier, and while the sky was cloudy, the clouds were more patchy and the sun was even popping through once in a while. Our downwind firebreaks were two gravel roads, so it didn’t take long to get those lines lit and blacked out. At that point, however, I walked out into the black to see how much litter consumption we were getting. While it was much better than the previous week, there were still some unburned patches. Since we had solid firebreaks, we paused ignition to wait for everything to warm up and dry out just a little more. About a half hour later, relative humidity had dropped nearly 10% and the temperature had risen about 5%. We restarted ignition and pretty quickly finished up the rest of the fire. On our second attempt, we had much better fire behavior. Here, a fire is backing uphill through vegetation and getting pretty complete consumption. Nelson is walking through the black in a low spot where not all the litter was burning well. This was while we were waiting for the humidity to drop a little more. Here are a couple timelapse videos of the lighting of the “flanking head fires” toward the end of the burn. They are a little jumpy (sorry) because I was just hand-holding my phone and taking repeated photos, but it shows how different the fire behavior was from the slow creeping fire of our first attempt 5 days earlier. If you can’t see the videos, click on the title of this post to open it in a web browser or click on these links: Video 1, Video 2. I’m glad we waited for more favorable conditions to burn this unit. We wouldn’t have accomplished what we needed to on the first day, and though it was hard to turn down a potential burn opportunity and assembled crew, I think we made the right call. As it happened, we didn’t have to wait long for a better day, and we got what we wanted out of that fire. At the same time, I’m also glad we decided to try a test fire on the first day. It turned into a good learning experience and fodder for fruitful discussion among the crew. The whole situation was a good reminder that while we can achieve many important objectives through prescribed burning, it isn’t a toy we play with for fun. Instead, we want to burn only when we can do so safely, and when we can achieve clear and specific objectives. If you want to learn more about how we combine prescribed fire and grazing to manage for habitat and species diversity, you can read more here. Last Friday, I wandered through the small prairie we burned back on March 10. Even though it is still very early spring, there were already a number of prairie plants popping out of the ground. I posted photos of this site right after the fire was completed. Today, I’m posting some photos taken 10 days later at the same site, along with some discussion of the impacts and effectiveness of prescribed prairie fires. 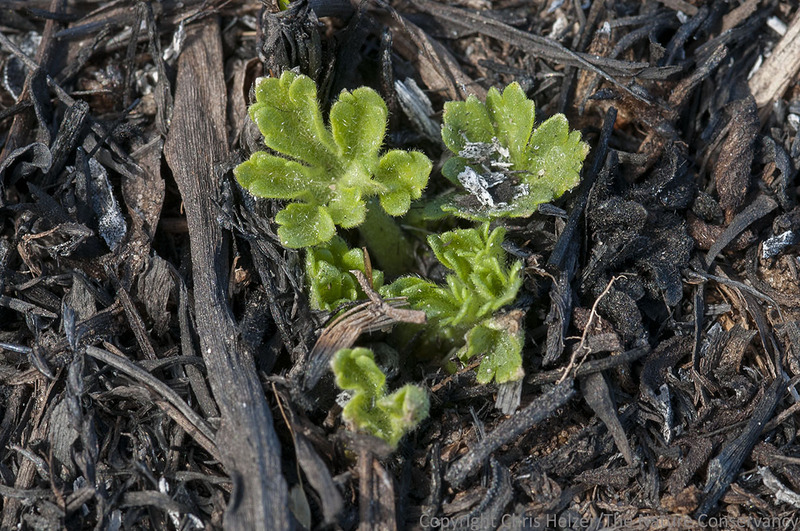 Purple poppy mallow (Callirhoe involucrata) begins its new year of growth. Most prairie plants grow from belowground buds, making them much less vulnerable to fire than trees and shrubs, which start their new growth above ground – from buds at the tips of branches. 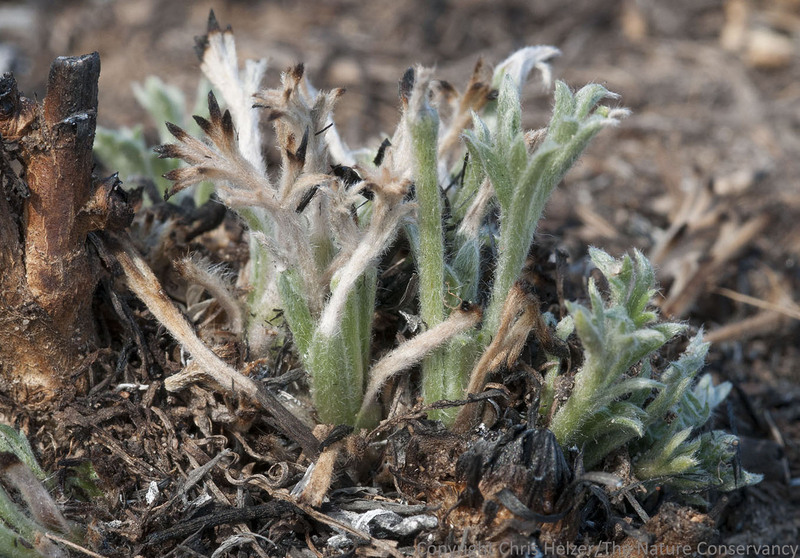 When fire burns woody plants, those aerial buds and living tissue are destroyed, stressing the plants and forcing them to start over from ground level. 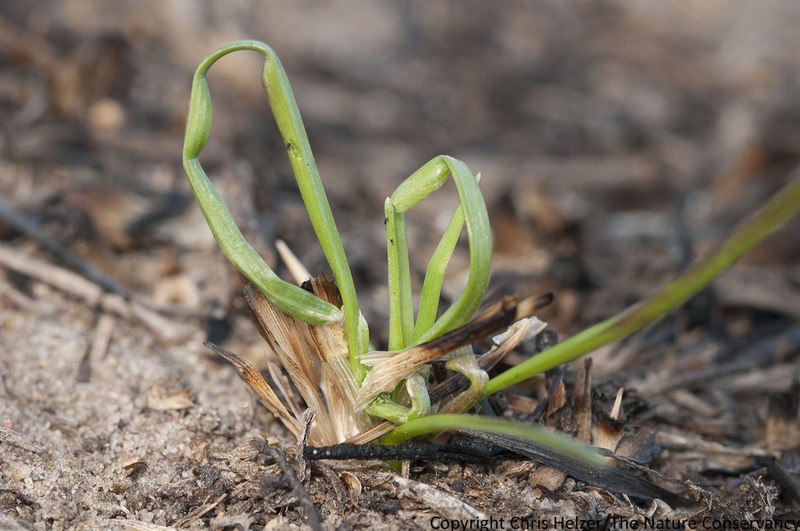 However, fire (at least during the dormant season) simply burns up the old stems and leaves of non-woody prairie plants, causing no injury. Instead removing those dead stems helps stimulate growth in the coming season, especially via increased sunlight, which warms the ground and is available to new shoots as they first emerge. Scribner’s panicum (Panicum oligosanthes), a native cool-season grass. In this photo, you can see that the tips of the grass leaves had just started to grow when the fire came through ten days earlier. Since the leaves grow from the base, those burned tips don’t impede plant growth. Increased sunlight hitting the ground has helped the small area we burned on March 10 green up much faster than unburned prairie nearby. Our main objective for the fire was to remove thatch in order to improve the effectiveness of planned herbicide treatment/re-seeding of some smooth brome patches within the small prairie. The brome is responding very strongly to the fire, and its rapid growth (and the absence of thatch to intercept spray droplets) will make the grass more susceptible to our herbicide treatment. However, since many other plants are also popping up, we’ll carefully spray only the thickest patches of brome where no other species are growing. Green sage (Artemisia campestre) growing next to its old stem from last year. Prescribed fire can be a useful tool when trying to temporarily flip the balance of power from cool-season invasive grasses (smooth brome, Kentucky bluegrass, etc.) to native warm-season grasses (big bluestem, indiangrass, etc.). However, timing is critically important. A dormant season or early spring fire is actually counterproductive unless it is followed by herbicide treatment, mowing or grazing. 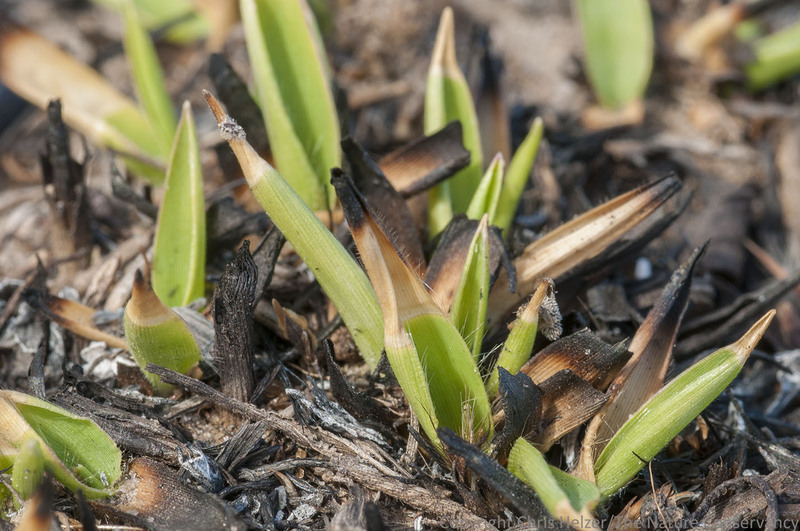 Those early fires stimulate the growth of cool-season plants – including smooth brome and Kentucky bluegrass – giving them a big advantage over later-season plants which won’t start growth until late April or early May. By the time those warm-season plants start growing, the early plants will have had a month or more to extract soil moisture and nutrients, and will be big enough to dominate competition for light and root space. If we’d wanted to suppress smooth brome solely with fire (and not follow up with herbicide), we would have waited until late April or early May to burn. That late season burn would have stressed the actively-growing brome and bluegrass and provided direct sunlight to freshly emerging shoots of big bluestem and other warm-season grasses. More often, we combine periodic fire and grazing to suppress brome and bluegrass and facilitate greater plant diversity. Along with smooth brome (Bromus inermis), Kentucky bluegrass (Poa pratensis) also responded well to the fire. This particular plant will likely have a very good year, but the brome and bluegrass in the thicker patches of this prairie will be sprayed with glyphosate herbicide and re-seeded. The regrowth of prairie plants after fire can seem almost magical. Fire is absolutely an important natural process and a very useful tool for prairie managers. However, prescribed fire is not magic, and doesn’t automatically lead to better prairies. As with any tool, fire has to be applied thoughtfully (and carefully!) in order to meet objectives. 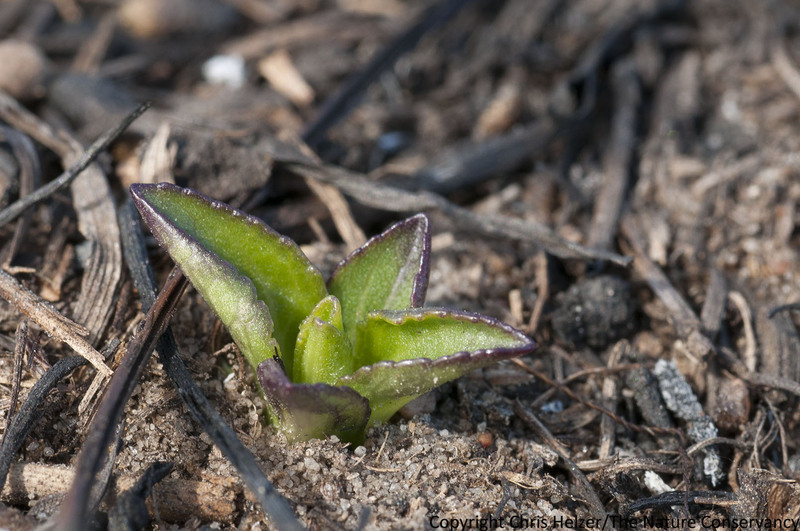 The timing of fire dramatically impacts the way prairie plant communities respond. Early spring, late spring, summer, and fall fires each have different effects on plants, and those effects are also influenced by soil moisture, the presence/absence of grazers, and many other factors. Prescribed fire can also have serious impacts on some animals, even during the dormant season. Many invertebrates, for example, overwinter in the aboveground plant stems or thatch, making them very vulnerable to fire. It’s important not to burn an entire prairie at once – especially if that prairie is isolated from other grasslands. I’m not sure what species of wildflower this is but I’m looking forward to finding out as it gets bigger! Fire plays many critical roles in prairie ecology – suppressing woody plants, removing thatch, stimulating microbial activity, aiding in nutrient cycling, and more. However, while fire is important and its effects are both useful and aesthetically pleasing, it is not automatically positive. Safe use of prescribed fire requires training, experience, and caution. The effective use of fire requires clear objectives and careful planning that ensures those objectives will be met. As I’ve discussed before, the actual process of conducting a fire can be very stressful. However, once the smoke clears and I can relax, its easy to appreciate both the beauty and ecological benefits of prairie fires. The emergence of bright green prairie plants through black ash is one of my favorite sights, and I love watching plant and animal communities respond and adapt to changing habitat conditions. In prairies, rising from the ashes is more than a metaphor – it’s a way of life.